A fiery glow charges the sky in Aert van der Neer's view along the New Amstel River. 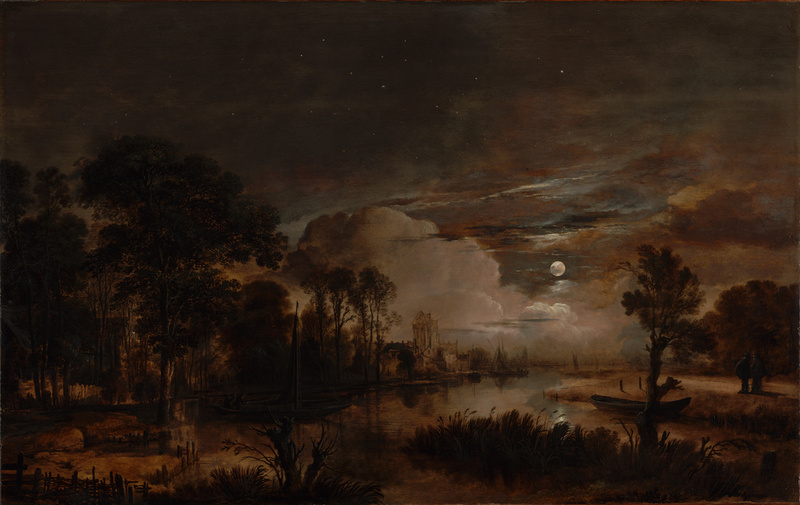 While most Dutch landscape painters in the 1600s used cloud-filled blue skies to endow their work with a powerful presence, Van der Neer mastered the genre of nocturnal landscapes. In this painting, the moon commands attention. Its light is filtered over the scene, emphasizing the river's watery surface and the outlines of trees and reeds. Two small figures at right are also highlighted by the moonlight. Van der Neer usually depicted imaginary places in his landscape paintings. In this rare example, however, he painted an identifiable landmark, the Castle Kostverloren. The evocative river setting, painted inside a studio, is not accurate. During the 1600s, Dutch artists typically composed idealized scenes with imaginary skies while indoors. Source: Addendum to the Collection of Oil Paintings in the Principal Residence and Guest House of the Hügel Estate, July 2, 1913. Bertha Krupp von Bohlen und Halbach, 1886 - 1957 (Villa Hügel, Essen, Germany), probably by inheritance within the Krupp family, probably 1957. Krupp Family Collection (Villa Hügel, Essen, Germany), with the dissolution of the Krupp family collection, to Irmgard Eilenstein, 1980. Source: Letter from Renate Köhne-Lindenlaub of the Alfried Krupp von Bohlen und Halbach-Stiftung. Michal Hornstein (Montreal, Canada), sold through Otto Naumann, Ltd., New York, to the J. Paul Getty Museum, 2000. Frederik Muller & Cie, Amsterdam. Tableaux Anciens. May 6, 1913, pp. 26-27, lot 73, ill.
Hofstede de Groot, Cornelis. Beschreibendes und kritisches Verzeichnis der Werke der hervorragendsten holländischen Maler des XVII. Jahrhunderts. 10 vols. (Esslingen a. N.: Paul Neff Verlag, 1907-28), vol. 7 (1918), pp. 463-64, no. 431. Hofstede de Groot, Cornelis. A Catalogue Raisonné of the Works of the Most Eminent Dutch Painters of the Seventeenth Century, Based on the Works of John Smith. Edward G. Hawke, ed. and trans. (London: Macmillan and Co., 1908-27), vol. 7 (1923), p. 425, no. 431. Katalog der Gemäldesammlung Hügel (n.p. : n.p., 1953), p. 20, no. 352. Museum Folkwang Essen zeigt in Villa Hügel: Kunstwerke aus Kirchen-, Museums- und Privatbesitz, exh. cat. (Essen: Grafa-Krupp, 1953), p. 14, no. 8. Kamptz, Ingrid von. Aus der Gemäldesammlung der Familie Krupp, exh. cat. (Essen: Villa Hügel, 1965), p. 32, no. 67. Stechow, Wolfgang. Dutch Landscape Painting of the Seventeenth Century (Oxford: Phaidon, 1966), pp. 177, 220n20. Bachmann, Fredo. "Zur Datierung der Frühwerke und der Mondscheinlandschaften des Aert van der Neer." Weltkunst 38, no. 15 (August 1968), p. 705. Bachmann, Fredo. "Die Brüder Rafel und Jochem Camphuysen und ihr Verhältnis zu Aert van der Neer." Oud Holland 85 (1970), pp. 247, 250, fig. 6. Müllenmeister, Kurt J. Meer und Land im Licht des 17. Jahrhunderts. Vol. 1,Seestücke und Flußlandschaften niederländischer Maler des 17. Jahrhunderts in privaten Sammlungen (Bremen: Carl Schünemann, 1973), p. 178, ill.
Hollandse Schilderkunst. Landschappen 17de Eeuw. (The Hague, Mauritshuis: 1980), p. 62, no. 682. Bachmann, Fredo. Aert van der Neer 1603/4-1677 (Bremen: Carl Schünemann, 1982), pp. 64-65, 85n98, fig. 60. Sutton, Peter C., et al. Masters of 17th-Century Dutch Landscape Painting, exh. cat. (Boston: Museum of Fine Arts, 1987), pp. 381-83, no. 59, ill., entry by Peter C. Sutton, pl. 42. Sutton, Peter C. "Introduction." In Masters of 17th-Century Dutch Landscape Painting, exh. cat. Peter C. Sutton, ed. (Boston: Museum of Fine Arts, 1987), p. 40. Slive, Seymour. "The Manor Kostverloren: Vicissitudes of a Seventeenth-Century Dutch Landscape Motif." In The Age of Rembrandt: Studies in Seventeenth-Century Dutch Painting. Roland E. Fleischer, et al., eds. (University Park: Penn. State, 1988), pp. 134-35, fig. 6-5. Sutton, Peter C. "Recent Patterns of Public and Private Collecting of Dutch Art." In Great Dutch Paintings from America, exh. cat. Ben Broos et al., eds. (The Hague: Mauritshuis, with Waanders, 1990), pp. 117, 119n46. Sutton, Peter C. Northern European Paintings in the Philadelphia Museum of Art From the Sixteenth through the Nineteenth Century (Philadelphia: Philadelphia Museum of Art, 1990), pp. 215-16, fig. 77-2. Wheelock, Arthur K., Jr. Dutch Paintings of the Seventeenth Century (Washington: National Gallery of Art, 1995), p. 184n4. "Part II: Paintings Sold in the Past." In Otto Naumann, Ltd. Inaugural Exhibition of Old Master Paintings, 12 January-1 March 1995, exh. cat. (New York: Otto Naumann, Ltd., 1995), p. 149, ill.
Schneider, Norbert. Geschichte der Landschaftsmalerei: Vom Spätmittelalter bis zur Romantik (Darmstadt: Primus, 1999), p. 187, fig. 140. Schulz, Wolfgang. Aert van der Neer. Kristin Lohse Belkin, trans. (Doornspijk: Davaco, 2002), pp. 45, 237, no. 426, pl. 50, fig. 133. Neumeister, Mirjam. Holländische Gemälde im Städel 1550-1800. Vol. 1, Künstler geboren bis 1615 (Petersberg: Michael Imhof, 2005), pp. 280-81, fig. 259. Blühm, Andreas. "Moons." In The Moon: "Houston, Tranquility Base Here. The Eagle Has Landed," exh. cat. (Houston: The Museum of Fine Arts, 2009), pp. 6, 26, no. 8, ill.